The driver of this auto was airlifted to a trauma center following an accident Tuesday evening on KY 8 at St. Paul. Deputy Matt Ross is investigating a single vehicle accident this evening at St. Paul that sent one to a Huntington, West Virginia, trauma center. 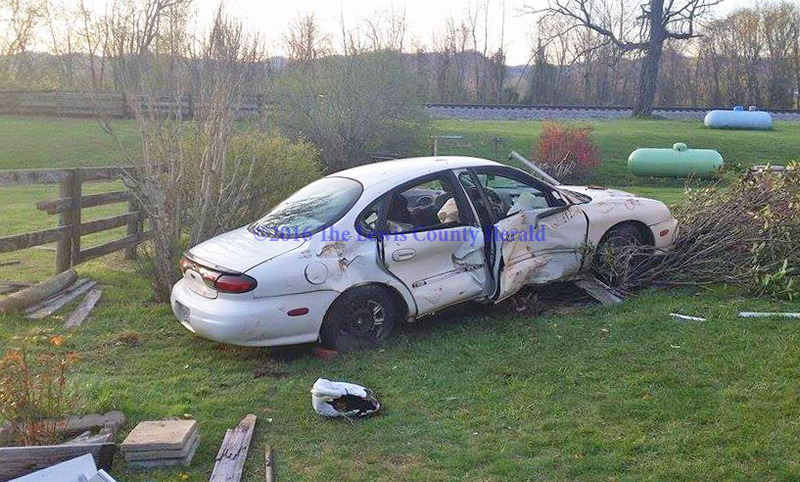 Ross said the accident happened about 6:15 p.m. on KY 8 west of Firebrick, near Red Gate Farm. He said 1998 Ford Taurus, operated by John Brown, 46, of Garrison, was traveling east on the roadway when Brown apparently went off the right side of the roadway, overcorrected, and went back across the roadway. The vehicle traveled through two plank board fences and struck a clothesline pole before coming to a rest in a residential lawn, Ross said. A landing zone was established near the Lewis/Greenup county line and Brown, who suffered multiple injuries, was flown to Cabell-Huntington Hospital in Huntington, West Virginia, by Air Evac, Ross said. Ross said he is investigating factors that may have contributed to the accident. He was assisted at the scene by Deputy Mark Sparks, Firebrick Fire and Rescue, Portsmouth Ambulance, and West Kentucky 8 Towing.